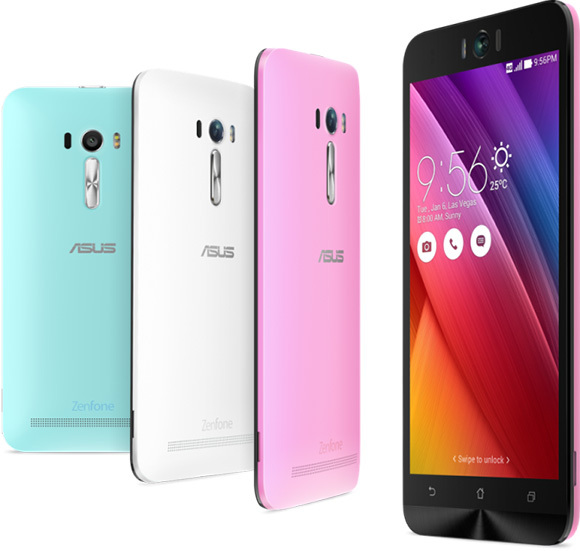 Asus has joined the Selfie phone club by announcing a new ZenFone Selfie model at the Computex 2015 in Taipei, Taiwan. The new ZenFone Selfie has a 13MP camera in the front for the self-portrait loving folks across the globe. Both cameras will feature laser autofocus, just like the one present in the LG G3 and the G4. Running Asus UI on top of Android 5.0 Lollipop, the ZenFone Selfie flaunts a 5.5” 1080p IPS LCD and is powered by Qualcomm Snapdragon 615 with Adreno 405 GPU for graphics. Just like the ZenFone 2 models, this phone too will be offered in 2GB or 4GB of RAM options along with 16/32/64GB storage options. To beat the likes of HTC Desire Eye, Asus has packed the ZenFone Selfie with a 13MP camera with Toshiba sensor in the front as well as the back. The front facing 13MP snapper comes with an F/2.2 aperture and bears 24mm wide-angle lens. The front facing camera by default offers 88 degree wide angle for clicking selfies and more area can be covered by switching to the selfie-panorama mode. While the rear camera has F/2.0 aperture and a 28mm lens. Asus is also offering an optional Swing attachment to adjust the selfie angle and it also acts as a kickstand. It would be better if the phone is provided with stock android rather than the skinned one. Also that better implement on screen buttons instead of the touch ones as in samsung.